What is The Connector Rx? 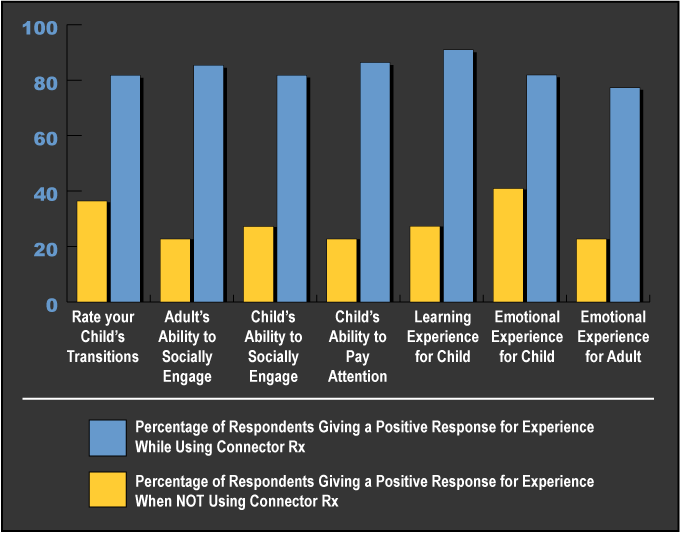 The survey results of the first twenty-two families to use the Connector Rx found that their children showed a significant improvement in their ability to pay attention, engage and learn when connected. As you can see from the chart above, transitions were smoother when using the Connector Rx, the adult and child both found social engagement easier, the child was better able to pay attention and learn, and both the adult and child had a more positive emotional experience when connected than when not. Every child is different, but with regular use, our clients have reported significant improvements in social capacities as well as improvements in behavioral and physiological challenges. If you are interested in participating in the continuing research of the Connector Rx, click here.